Celebrites and friends have been paying tribute to actor Gary Coleman who has died after suffering a brain haemorrhage. The former star of 70s sitcom Diff’rent Strokes was reportedly treated in hospital for a serious head injury after a fall at his home in Utah. The 42-year-old was taken off life support and died with family and friends at his side, according to a spokeswoman for the Utah Valley Regional Medical Centre. Sue and William Coleman reportedly had not spoken to their son for 10 years. 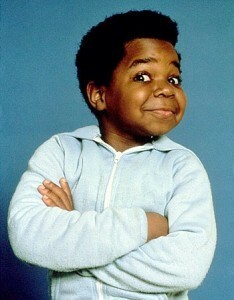 Gary Coleman sued his parents and business manager in 1989 for allegedly stealing his fortune, a claim his parents deny. The feud, if I recall correctly, was as a result of the senior Coleman’s trying to take over the financial resources of the junior, when he was in some serious rehab or other. Seemed to me at the time that there was a serious lack of maturity on both their parts. Also seems to me that ten years is a long time to not say anything at all to each other. They handled the situation badly and alienated their own son. Yes, he was out of control. But they’re the ones who are going to have to live with their mishandling the situation. I am somewhat sympathetic to the parents here, but not totally so. As for the former child actor himself, somehow, you just knew this guy wasn’t going to be with us long. Granted the health issues involved with his genetic condition would have caused a shorter lifespan anyway, but one got the idea that his self-abuse was going to cause this to go down even faster.